An ambitious plan to develop Quebec's north — an area about twice the size of France — was being hailed by Premier Jean Charest on Monday as an effort that will be key to the province's future. The Plan Nord — or "Northern Plan" — would touch on energy development, mining, infrastructure, tourism and conservation in a sweeping set of projects that, according to the government, would receive $80 billion in public and private investment over the next 25 years. Political observers have long considered the plan, which Charest had promised for years, a potential centrepiece of the premier's political legacy. 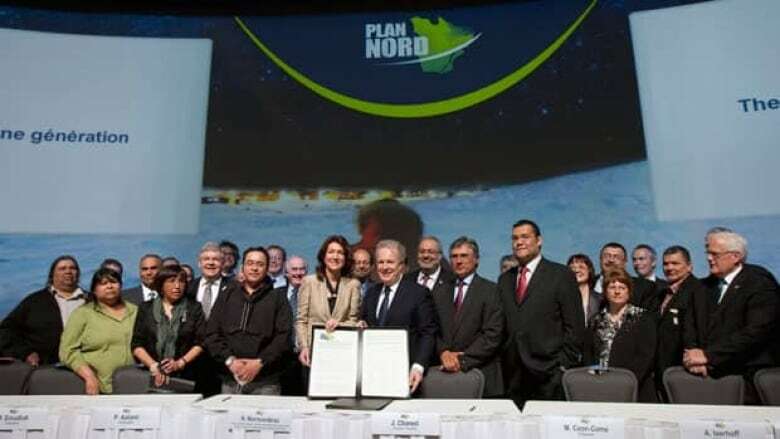 "On the political level, this is one of the best moments of my life," Charest told a news conference, where he described the effort as a partnership between the Cree nation, the Inuit and all Quebecers. "This is one of the reasons I got involved in politics." Besides eventually generating $14 billion for provincial coffers and creating an expected 20,000 jobs, the plan seeks to exploit mineral deposits in the area such as iron, nickel, copper and diamonds. The plan foresees 11 new mining projects during the next few years which, the government says, would generate $8.2 billion in investments and create 11,000 jobs during the construction phase alone. An initial $2.1 billion will be spent by Quebec on infrastructure such as roads and airports as well as feasibility studies. The roads would be to such areas as mining sites and would be a rare addition to the region — where communities are isolated from one another, and air travel is commonly required for things like medical care and grocery deliveries. A study will also be conducted on the possibility of constructing a deep-water port on Hudson Bay, at Kuujjuarapik. The development plan is expected to generate about 3,000 megawatts of renewable hydroelectric energy for the province. Besides energy, the northern plan also sets aside a vast territory that would be exempt from industrial development. "One of the important parts of all of this obviously is the protection of our environment," Charest said. "Fifty per cent of this territory will be protected from industrial development, which is extremely significant. That in itself represents a territory that is the equivalent of the land mass of France and it gives us a scope of what's involved in the extraordinary potential of northern Quebec." The conservation efforts will include the planting of 100 million trees to ensure the reforestation of the area. The region covers about 1.2 million square kilometres and includes Nunavik and James Bay. Mathew Jacobson, manager of the Pew Environment Group's International Boreal Conservation Campaign in Quebec, praised Charest and said he had announced "the largest land conservation policy in history." "It seeks to balance conservation with development in a region that is home to some of the world's largest remaining intact landscapes," Jacobson said in a statement. "We are pleased that the government has pledged to include ecological planning in its legislation and to protect at least half of the boreal region from industrial activity. "Quebec's vision of integrating economic development and conservation on such a grand scale is unprecedented, laudable and very complicated." The mining industry also lauded the plan and the Quebec mining association said its members are keen to exploit the natural resources of the vast territory. "We see that the Quebec government wants to stimulate, wants to participate in this development," said Andre Lavoie, an association spokesman. He said China and other emerging countries are ready markets and that the province will benefit from increased royalties for its efforts. He acknowledged one of the biggest challenges will be recruiting skilled workers to go to the remote area. He said while locals will be employed, workers could also be drawn from Colombian and Romanian immigrants who have experience. Not everyone was pleased. Christian Simard, a spokesman for the Nature Quebec environmentalist group, feared there is no plan to spread the economic benefits to the region itself. "These companies will come in, exploit the wealth and exit quickly," he said. The chief of the Assembly of First Nations of Quebec and Labrador said he was boycotting the announcement because the plan did not adequately meet the needs of First Nations people. Chief Ghislain Picard says he's still waiting for a phone call from the Quebec premier to discuss subjects like wealth-sharing, co-management and royalties. The Assembly of First Nations of Quebec and Labrador represents 43 chiefs. The plan also calls for the construction of 500 new low-cost housing units during the next five years to help alleviate the shortage of dwellings in the region.